A center axis is stands straight in the center of the wheel. 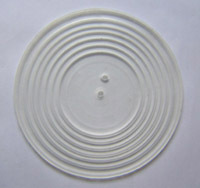 a diameter of 6mm, length are 130mm. It is stopped with a screw to a wheel disk well. There is a bolt hole of the rotation stop in a position a little away from the center of wheel. 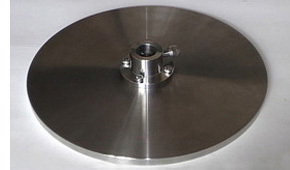 FP wheel is to have begun to cut down from a stainless mass. 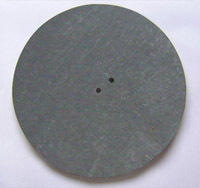 The a diameter of 300mm, thickness 14mm. We do not have to worry about the rust. If a center axis is exchanged for the one that doesn't project, it is possible to use it as a usual potter's wheel. shaft holder is also stainless steel the thickness of 8mm. FP WHEEL fits Shimpo wheelheads and the aothers. 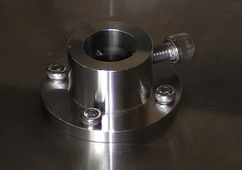 A center axis begins to be cutting down from a stainless stick. The main parts are all made of stainless steels. The surface might not get rough like aluminum. 130mm in length. Beginning cutting down from stainless steel. In the flange 16mm below, it stands vertically. Driver to turn a center axis. Made of stainless steel. Two holes is a jig for maike the hole. Tightens up a screw,　a surface becoome flat as usual potter's wheel. Wrench to detach and to fix rotation board. It fits the sympo wheel. For center axis: 12mm etc. It is made of the stainless steel. 30cm in length and centers puncture by 6mm. Because the thickness of the stick is 10mm, the right and left of the hole is 2mm respectively. It is safe so that the stick may break previously even if there are some inconveniences. 240mm under neck. Made of stainless steel Press-fitting. Use for a deep work. The ditch is carved for an acrylic board of thickness 8mm. The order for a specified size can respond, too. A water-proof sandpaper is pasted to an acrylic board of 5mm in thickness. Using to cover on a center axis, and to bury the hole.